Perhaps her real audience was not her contemporaries in the civil rights generation, but their grandchildren. It wasn’t the first time I had seen this clip in my social-media universe. Social media’s power in the 21st century is its uncanny ability to make the invisible ubiquitous. Old photographs celebrating Simone’s style, video clips of her rare performances and interviews, these artifacts trickle through my newsfeeds frequently. Simone has had a digital life and popularity that may not be fully understood by the older generations to whom she originally spoke. Her cult following offline has continued to gather steam, too, enough to stimulate three new films, including two documentaries, What Happened, Miss Simone, released June 24 in theaters and streaming on Netflix, and The Amazing Nina Simone, slated for release later this year. Both films are at once personal portrait and celebration of her music’s impact on social activism—not just on the civil rights and black power movements of the past, but also in today’s hip-hop infused black politics and culture. Before the new social-world order, back in the days of analog, Simone entered my consciousness through my friends. Verve reissued compilations of her more famous works, which we shared with one another enthusiastically. My more talented friends would sing their best covers of “Feeling Good,” as did many professionals. (The British band Muse and Michael Bublé put in a worthy attempt, but Lauryn Hill’s recent performance has effectively shut all contenders out.) Jeff Buckley’s cover of “Be My Husband” sent us hunting for Simone’s original recording. As a second-generation child of the civil-rights movement, my sonic universe consisted mostly of Public Enemy, Tribe Called Quest, and Wu Tang Clan, all narrating a hybrid blues and politics that I could touch. By contrast, Nina’s voice was air. My first listen to Simone was six years before her death in 2003. I’d heard nothing like it previously. You cannot hear a voice as complex, as honest, as beautiful, risky, and unhinged as Simone’s and it not reach you. And at this critical moment in our national life, Simone’s voice has once again reached an urgent pitch, her music and activism has recaptured our cultural imagination again. Civil Rights-era music is often associated with a particular soundscape, which is popularly understood as gospel mixed with the pop sensibilities of Motown. This understanding erases Simone’s vital contribution, the full depth of her contribution to secular music consciousness, her role in orienting black and white audiences alike to the liberation struggles of the civil-rights movement. Yet the steady ascendency of Simone’s popularity since her death proves the lasting, complicating value of her art in our politics. Only once I was exposed to the 2008 album, Protest Anthology, which is a mix of interviews and performances by Simone, did it finally click how much of the power and genius of her voice had been hidden from us. In 1964, radio stations stopped playing her music, scandalized by her offensive language as much as her condemnation of the Jim Crow South. That censure would be followed by more damaging exclusion, from promoters and venues who refused to book her performances to her dwindling television appearances. Her contemporary audience shrunk. And yet Simone’s attempts to meld her music, voice, and politics arguably influenced other artists later in the 1960s, nudging them to create work that reflected the times. I wonder if we’d hear Marvin Gaye’s “Inner City Blues” in 1971, had Simone’s “Backlash Blues” not entered the world four years earlier? When we consider Simone’s politics and art melding as they did during the civil-rights era, we begin to see how she also informs hip-hop aesthetics and the modern nexus of black art and activism. Simone’s earliest entry into hip-hop’s lexicon came via Lauryn Hill’s shout out in the Fugees’ 1996 single “Ready or Not.” Talib Kweli followed Hill’s invocation when his adaptation of “Four Women” in 1999 acknowledged Simone’s influence in storytelling, song, and heartbreak. Later, in Kweli’s chart topping, Kanye West–produced single “Get By” (2002), Simone’s urgent wail and moan is immediately recognizable. West’s love affair with Simone continued, as she made sonic cameos in three of his own projects (“Bad News” in 2008, “New Day” collaboration with Jay Z in 2011, and “Blood on the Leaves” in 2013). How could you not recognize Simone’s spirit while watching J. Cole’s visceral performance of “Be Free,” filmed as the black lives matter movement was reaching a critical turning point. Simone had no love for hip-hop, declaring, “It’s not music at all. It’s just beats and rapping”—a critique that surprises me, given the percussive nature of her music and its melding with her “gravel” and “coffee and cream” vocals. Hip-hop’s aesthetics stem from profound social awareness and truth telling, from confrontation and cultural criticism of structures of inequality. Simone may have expressed disdain for hip-hop, but it has been hip-hop, in part, that has rekindled the spark of her genius for the post–civil rights generations. 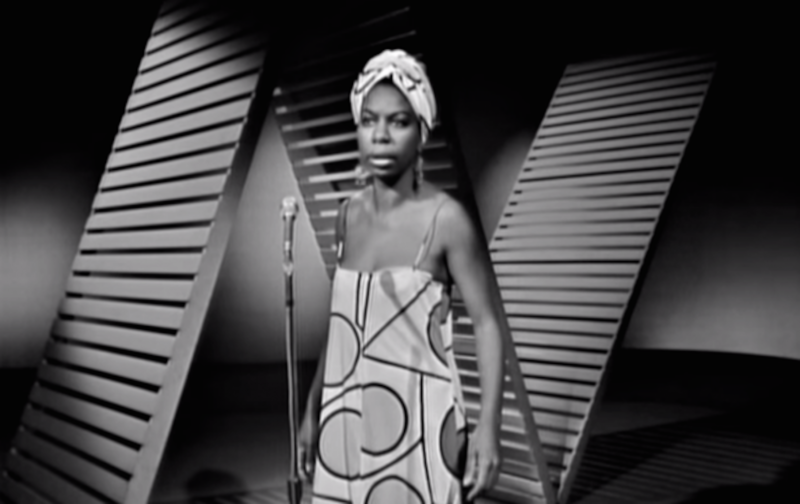 Nina Simone showed up for us, then and now. Her blackness was the earliest encouragement for so many of us to risk discomfort—or more precisely, to risk white discomfort to engage the urgency of black America’s demands and of the fight for true equity in American society. I watched her 1965 performance of “Mississippi, Goddam” projected on a large wall in a continuous loop for 20 minutes last summer, at the Brooklyn Museum. The video was part of an exhibition marking the 50th anniversary of the passage of the Civil Rights Act. In her face and voice, the outrage and insistence of action were plain. As she improvised, differing her phrasing from the recording I’ve listened to for years, it ceased to be a song and became a rallying cry. John Coltrane also composed a piece like this after the deaths of Addie Mae Collins, Denise McNair, Carole Robertson, and Cynthia Wesley, who were killed in the 16th Street church bombing in 1963. His is also an aching kind of elegy, in which his horn creeps high and lands in a melodic, yet cacophonous outrage. Jazz and blues were vanguard and fringe in that way. When we consider the continuum of jazz and blues artists who reached into our collective consciousness—into the visceral and contemporary concerns that gospel couldn’t articulate, or that pop music from the Motown hit factory deliberately ignored—Simone’s body of work looms large. Popular and gospel musicians in the 1960s hadn’t been making music that articulated the real time struggle of African-Americans—or to be more precise, the real time political struggle of black and brown people. Simone performed and communicated black, righteous anger. Here again, a black woman’s voice, defiant, blustery, and raw. A black woman that penned a rallying cry, singing the collective outrage of black death, cursing God and country simultaneous, indicting the system and culture that produce the kind of violence that would murder black girls in a church on a Sunday morning. That provocation set Simone apart. Simone sang the thing everyone was thinking, but was too afraid to speak. She showed up for us, in a way that we are demanding of artists right now. In the aftermath of the Charleston murders—as we still track police killings of unarmed civilians, as we hear troubling reports of black churches burning around the South—we still want our popular artists to use their platform to speak up, to not be silent, to dramatize our humanity. Thinking of Simone singing “Mississippi, Goddam” to that Dutch audience in 1965, with her gaze fixed and her lyrics updated to fit the current news, I am reminded me of J.Cole’s performance on David Letterman’s show last December, which was inspired by the death of Michael Brown. Simone, the patron saint of the artist-activist, in the tradition of Langston Hughes, James Baldwin, Lorraine Hansberry, and Harry Belafonte, responded to what she described as a “duty,” but not without tremendous personal sacrifice. While Simone may never have felt that her contribution was fully appreciated by her contemporaries, perhaps her contemporaries were never her rightful audience. Perhaps it is the generation of the “22nd century,” the post-post–civil rights generation that will most urgently need her politic and her music. Syreeta McFaddenTwitterSyreeta McFadden is a freelance writer and columnist for The Guardian US. She is the managing editor of the online literary magazine, Union Station.